Kakuma Valley (角間渓谷) is located in Ueda, Nagano Prefecture. Legend said famouse one of "Sanada Juyushi( 真田十勇士)," 10 Ninja of Sanada, Sarutobi Sasuke (猿飛 佐助) trained his jumping skill here. There is a hiking courses, and in falls, you can enjoy a beautiful Autumn leaves. There is a parking. Hiking course is not so long. This is where Sanada Ninja trained their Ninja Techniques. There are many interesting rocks which called Sarutobi Rock. 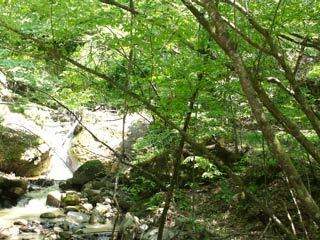 It is also chosen as one of 100 best forest of Japan. There is Onsen called Kakuma Onsen is located at the entrance of the valley. You can enjoy Onsen after enjoy hiking Ninja Valley.